FEMDEV is a small-scale NGO in Cote d’iVoire that has spent the past few years impacting women and children in the city of Abidjan. Catering to under-privileged women and children, FEMDEV has worked tirelessly to give this ignored people group the leverage they need to transform their lives, specifically in areas of empowerment, education, and health. 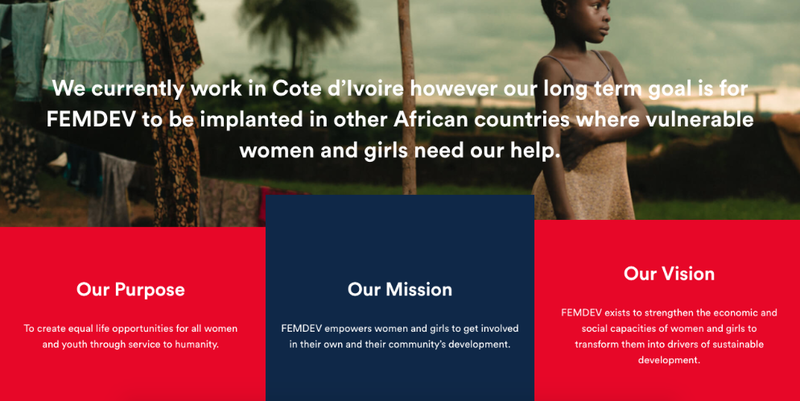 Now aiming to gain awareness beyond just Cote d’iVoire, with the goal of spreading to other African cities and leveraging on partnerships with larger NGOs to create even more impact, the organization wanted to redesign their website. In designing their site, we knew we had to shed light on the real life stories of the individuals whose lives had been changed by the organization. Going through the images and reading the stories that the client sent, we saw that highlighting these individuals’ stories would not only resonate with people but give them a picture of FEMDEV’s heart for women and children. In doing that, we decided to use the raw images as they came, usually we like to either photograph images ourselves -like we did for this brand, or use good quality images. But we decided in this case the individuals’ stories’ had to be shown as they were, pixelated images and all. So alongside the great stock images that we used to depict the heart of brand, we also used the pictures of real life beneficiaries. This helped us tell the story beautifully, through images and of course copy as well. Susan is an avid lover of design. When she’s not working, you can find her reading, eating or admiring anything that’s a combination of aesthetics and functionality done right.